Should Pokemon Stadium be Released on the Virtual Console? As any Pokemon fan likely already knows, the original Pokemon games are being released on the 3DS Virtual Console this month. But while seeing Pokemon Red, Blue and Yellow reborn on the 3DS is amazing in its own right, it makes me wonder whether there’s something else that make it even better. Then, it kind of struck me. What if, as well as the original Pokemon Game Boy games, the Pokemon Stadium games were ALSO released on the Virtual Console? Perhaps the Wii U or Nintendo NX one? It’s possible on a technical level, games like Super Smash Bros let you connect the 3DS and Wii U versions together, as a way to transfer data between them. So imagine if the same was done here, with the 3DS to Wii U connectivity replicating the Nintendo 64’s transfer pack? Above: We need this on the Virtual Console. That way, not only would we get to relive the 90s experience of ‘catching them all’, but we’d also get to bring them to the home console and have them fight in 3D like we used to be able to. We could revisit the Gym Leader Castle in an attempt to try and win an exclusive Pokemon (you got a starter, a fighting dojo Pokemon or a fossil Pokemon every time you beat the Champion). We could play all those fun little mini games that everyone remembers. And heck, how about the old Game Boy Tower thing? I’m sure a lot of Pokemon fans would just love to play through their 3DS Virtual Console games in Doduo (double speed) or Dodrio (triple speed) mode! Implement a way that Pokemon can be transferred from gen 1 or 2 to the current generation of Pokemon games. Would it be challenging? Oh sure, but it’s already been done by fans. A company like Nintendo could easily figure out a way to let us bring our gen 1 party to Kalos and Hoenn via the latest Pokemon games, right? Or maybe even a way to bring them BACK, in case people want to be insane enough to transfer the first 150 Pokemon from their Pokemon X/Y game over to Pokemon Red/Blue/Yellow. Like the Time Machine in Pokemon Gold and Silver, except much better. 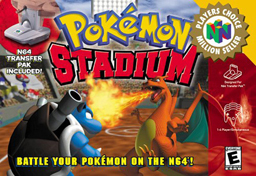 But small steps first, I think Pokemon Stadium on Virtual Console would be an incredible idea. Bring back these forgotten classics, and give us all a nice way to see our Virtual Console raised monsters on the big screen!